Brigantine's container trading team is proud to source and offer the best quality containers globally to fulfil your requirement. With more than 50 years of vertical and horizontal shipping industry networking, Brigantine has built up strong relationships with leading container manufacturers. 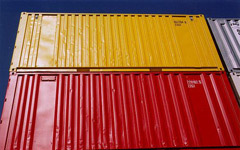 We are able to quote a variety of best-quality new built dry and reefer containers at attractive prices. We supply new and used special containers for any function, which can be tailor made as per user's requirements or specifications. Brigantine runs our own dry and reefer repair workshops and depots as well as manages others in Asia. All repairs are performed by qualified repairing teams and professional reefer technicians, whom meet international standards and worldwide shipping lines and leasing firms' cargo worthy criteria. We are also the authorized reefer repair center for Thermo-King, Carrier, Daikin and StarCool. Brigantine offers batches of the finest selection of various ex-liners / ex-leasing firms' used containers in "As Is Where Is" condition at a lump-sum special price. .
Brigantine offers the premium prefabricated containers to meet your desired designs in various projects. These modular houses provide a cost effective solution for your leisure or commercial needs, as separate kits are available for easy assembling and conversion to kitchens, ablution and accommodation. The four prefabricated containers can be packed as one ISO container dimension to save shipment cost. Brigantine supplies various pallet containers for your specific supply chain usages in the Sea, Air and Land transportation as well as the warehouse storage. The foldable designs of the pallet container can be assembled and discharged easily without the requirement of extra tools. Sales containers in either new-built or used condition may be delivered by our advanced one-way repositioning services via the international carriers. Our timely one-way onhire / offhire control and monitoring can further enhance your savings on shipment costs and administrative resources. A variety of leasing services with flexible terms in both dry and reefer containers can be offered to meet your temporary storage, inland, or cross-border transportation and logistics requirements. .